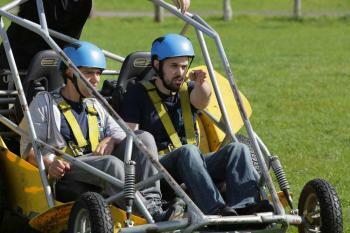 These hilarious machines have two seats and two engines, one controlled by each throttle-jockey, which power the wheels at different speeds. In order to drive quickly around the course you have to synchronise throttles. Cue teamwork and hysterics as you struggle to coordinate with your co-driver! Wheelies, huge skids and uncontrollable laughter are the inevitable results of a go in a Powerturn buggy… Blast around the track in the shortest time possible, sliding sideways through the corners not only saves valuable seconds but looks and feels awesome! Powerturns require quite a bit of outside space and can tear up the grass; not all venues allow them on events - our team will be able to suggest some venues near you. 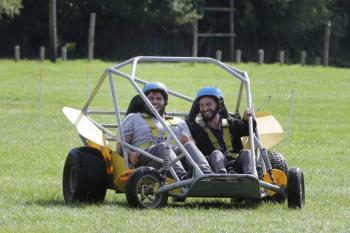 These riotous buggies are standard on Club Adrenaline and Motorised events, and an exciting extra to Country Sports. Powerturns are also a perfect inter-generational activity on Family Fun Days.